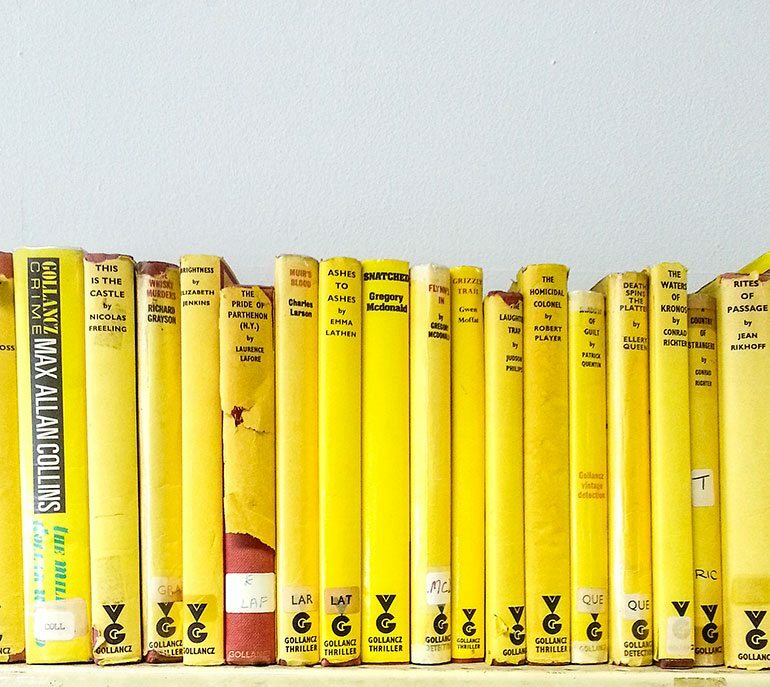 I was in Sea Point yesterday, killing some time before yoga, and popped into the CAFDA bookshop, where I spotted this entire shelf of yellow-jacketed books. I can’t believe I hesitated for even a moment, before I bought the whole lot for the shop. Colour blocking here we come! I must say, I was intrigued by the sheer volume of yellow-jacketed books, all of which are published by Gollancz Books. Many of these seem to be thrillers, and have pretty fruity titles and cover text – “Death in the Summerhouse? No! This is not a thriller” – but nonetheless, it seems the Gollancz was a major British publishing house, established in 1927, with Daphne du Maurier, Kingsley Amis and George Orwell in their lineup. Orwell and du Maurier seem to have been spared the exclamation marks and lush cover prose of their fellow authors, however. But somehow, the fact that Gollancz eventually ended up as the fantasy imprint of Orion Publishers, seems kind of fitting. Posted in Style & Inspiration and tagged books, colour, gollancz, yellow.